Don’t Dump Rabbits is in Bunny Mad Magazine! 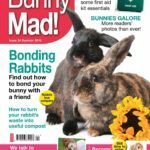 I am proud to say that Bunny Mad Magazine from the UK has published a short article I wrote about rabbit rescue! Please check it out on the Don’t Dump Rabbits website and Facebook page. Bunny Mad is a quarterly full color, glossy, beautifully laid out magazine filled with everything that is informative and fun about rabbits. I love this magazine. Hooray for the bunnies and thank you Lisa Hodgson, Editor of Bunny Mad. This entry was posted in Media, News Updates by bekind. Bookmark the permalink. So excited for you! You are a tireless advocate for the bunnies!